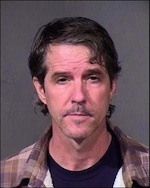 Chris Simcox, the erstwhile border vigilante Minuteman movement leader, has been sitting in the Maricopa County Jail for over a year as he awaits trial on two counts of child molestation, one involving his own preteen daughter. But, judging from a recent court appearance, he is confident that he will win his freedom. How? Apparently Simcox has some secret evidence. According to a report from Stephen Lemons at Phoenix New Times, Simcox indicated during a recent court hearing on a possible plea agreement that there is previously unknown reasons for his arrest. However, Judge Joseph Welty of Maricopa County Superior Court apparently was not buying. Saying that Simcox was suggesting “some grand conspiracy at play,” he reminded Simcox, 53, that the evidence against him also involved victims who were not his daughters, and that the charges he faced were not political crimes. The purpose of the hearing last week was to review the plea bargain that prosecutors had offered to Simcox earlier this year that would limit his prison time to seven years in exchange for a guilty plea. However, Simcox adamantly continued to refuse the deal, saying he intended to prove his innocence in court. Simcox’s refusal ensures that the two victims in the case—one of them his now-teenage daughter, the second being a friend of hers who Simcox was supposed to be babysitting at the time—will be required to testify on the stand. The trial is scheduled to begin Dec. 17, but Simcox’s decision on the plea bargain probably means it will be pushed forward to January. According to Lemons, a previous judge in the case ensured that so-called “propensity evidence”—involving previous incidents that suggest the defendant’s crime is part of a behavior pattern—would also be admitted. As the SPLC reported in 2005, Simcox was accused by his first wife of molesting another daughter when she was a teenager, though no complaint was ever made to police. His second wife also sought custody of their teenage son because, she said, Simcox had become violent and unpredictable. His third wife—the mother of his current accuser—took out a restraining order against Simcox in 2010 when she divorced him. If convicted, Simcox could face up to life in prison.